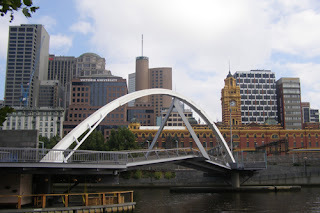 My Australian adventure includes a lot of hotel hopping which I look at as the chance to discover some new places. Unfortunately, that often also means leaving places before I can totally check them out, but I do like to pass along any gems I find along the way. Within Melbourne, The Langham definitely fits in this category. One of my favorite aspects of The Langham was the hotel’s ability to combine the lap of luxury with down to earth friendliness. It ranks among the most opulent hotels I’ve been at, with amenities such as doorbells on the room door, slippers and water bottles at your night table, breathtaking views from the windows (below) and a full wooden box of individually wrapped items of just about anything you could need in the bathroom, next to the large soaking tub. 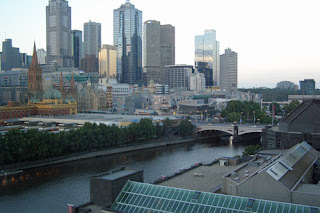 I didn’t have a chance to experience The Langham’s spa, High Tea, Chocolate Spread, Melba Restaurant or Spa, but I did head down to the Aria Lounge. Petra was as welcoming as the rest of the staff and she led me through the list of Australian and New Zealand wines as I tried Tyrell’s Lost Block Semillon (very light and refreshing), SkipJack Sauvignon Blanc (full of fruit) and Brown Brothers Crouchen Riesling, my final choice for an accompaniment to my cheese platter, which came with fruit and a delicious nut bread. 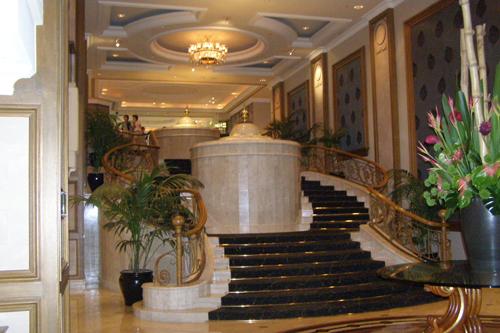 Aria Lounge also offers a selection of sandwiches, oyster plates and kid’s fare, in a very relaxing atmosphere. In addition to the wine and a large spirits collection, they offer a nice selection of cocktails, including : Lungo Finale (St. Germain, Amaretto, Frangelico, Apple Juice, Marmelade and Ristrett); Green Fairy (Absinthe, Apple Schnapps, Passion Fruit and Apple Juice); and Angel (Gordon’s Gin, Cointreau, Lychee Puree and Sparkling Wine). The Langham is in a great location by the Yarra River, where restaurants and coffee bars line the street. 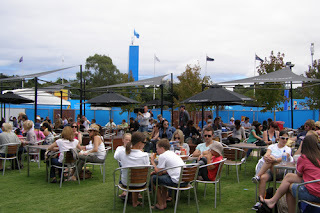 It’s also easy access to the Australian Open, where I’ve been spending a lot of my time. I happen to be a big tennis fan (and writer), but there’s a lot more going on there than tennis. It’s also a great place for wine lovers thanks to Australia’s very own Jacob’s Creek. I will be heading to their winery next week. In the meantime, I took a peak at what they had to offer Australian Open guests. 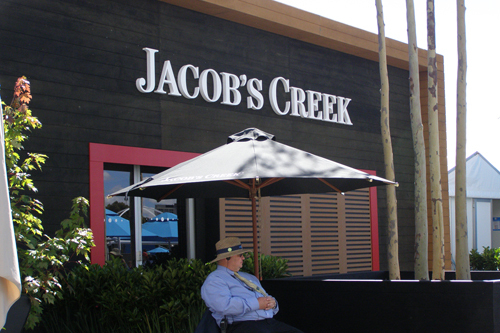 If you are lucky enough to get a corporate invite or purchase a package with inclusion, the Jacob’s Creek Heritage House across from Rod Laver Stadium is where you can experience fine dining along with some of their latest wines, which are not yet available for sale. If you don’t have connections, don’t worry, there are still plenty of options to enjoy Australia’s largest wine brand. Within the Melbourne Park grounds you will find their wines at 24 locations for a refreshing Sauvignon Blanc on a hot summer day or a Shiraz to enjoy with a barbecued steak at the Jacob’s Creek bar. There are also sparkling wines and reserve collections you can sip while watching tennis on the giant screen (or enjoying sunsets). The Australian Open, like many large tennis tournament these days, has become about more than the sport, in fact, Jacob’s Creek’s Paul Di Vito is free to call it “a carnival.” There’s even an adults-only area within the Grand Slam Oval where Jacob’s Creek lounge chairs encourage relaxation and Heineken is also sold for an occasional break from wine. If you are looking to sit down at a table for a meal, Café Arena is open to everyone and you can get wood fired pizzas with wine by the glass or bottle. For Australia Day on January 25th, the wine will be poured while celebrity chef Pete Evans cooks on the barbie at the Jacob’s Creek wine bar. Before I head back to tennis, I'm spending a few days in Yarra Valley, where I get to check out that region's wine from Domaine Chandon, De Bartoli and Yering Station.